Six people were injured yesterday after a bomb exploded in front of the ruling Justice and Development Party’s (AK Party) İstanbul headquarters in the Sütlüce district. Güler said four police officers and two AK Party members were injured in the attack, adding that two of the injured were in critical condition and undergoing surgery. 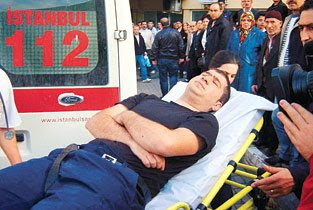 Güler said it seemed likely the explosion was caused by a bomb, but ruled out the possibility of a suicide attack. He said the cause of the blast would be known following examination of security camera footage and witness statements. "Initial reports indicate that a bomb wrapped in a package exploded. This is all I can say at the moment," the governor added.